The Prins Valdemar was a four-masted Danish barkentine sailing ship that had an interesting journey. Built in 1892, the vessel had served many roles throughout its lifetime: a training ship for naval cadets, blockade runner, gun smuggler, cargo transporter, hotel, aquarium, restaurant, beer parlor, navy chief petty officer’s club, youth center and civil meeting place. It led quite a sixty year existence. When it was dismantled and sold for scrap in 1952, the Prins Valdemar may have been best known as an aquarium located near Bayfront Park. However, it was shortly after its arrival to Miami when the ship was in the headlines of the local papers for all of the wrong reasons. The Prins Valdemar was built in Helsingør, Denmark, in 1892. The ship was named for a royal prince who won the admiration of his countrymen for refusing the throne of Bulgaria in 1885. She was originally rigged as a barque and served as a training vessel while roaming the high seas. However, several years after she was commissioned, the ship was caught running guns during the Mexican revolution and was seized by the Mexican government. The ship was sold to an American firm who in turn used it to transport lumber between Australia and the west coast. The ship had a 21 foot deep hold and could pack 1,500,000 feet of lumber between her decks. The Germans purchased Prins Valdemar and retrofitted the 240 foot vessel as a barkentine. It was used by the Germans as a blockade runner in World War I. The ship was one of the Germans most successful blockade runners until a British torpedo chased it into Copenhagen, a neutral port, where she remained until the end of the war. After the war, an American syndicate purchased the Prins Valdemar and sailed her into a New York harbor. It sat for two years before being used to transport coconuts from Nicaragua to New York. Given the configuration of the cargo area of the ship, there was a lot of wasted space when shipping coconuts and therefore the Prins Valdemar was not well suited to economically transport coconuts. Therefore, it was once again used to transport lumber. The transport of building stock is what brought her to Miami. Richard J. Walters earned his ship captain’s license in 1923. During World War I, Walters was a commander of the U.S. Army’s Hot Air Balloon division. After earning his captain’s license, Richard partnered with George Risen, who was a New York City hotel owner. 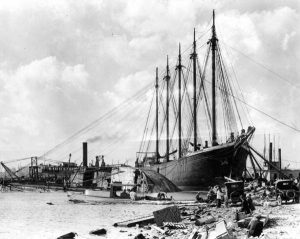 The partnership acquired the Prins Valdemar in 1922 and used it to transport much needed lumber to Miami during the building boom of the mid-1920s. Both men saw another opportunity in Miami. The young city was rapidly growing, and living accommodations were very scarce. Walters presented Risen with a plan to convert the ship into a floating cabaret with one hundred hotel rooms, a fine restaurant and an entertainment lounge. The plan was for the hotel to be moored alongside a dock in downtown Miami once the conversion was complete. The Prins Valdemar came into Miami on its final voyage at the end of October in 1925. It was done transporting lumber, and work began to retrofit the ship into a floating cabaret. The grand opening of the hotel was scheduled for January 24, 1926. However, fate had other plans. In the early part of January, 1926, the crew was making good progress converting the ship into the cabaret that Walter had envisioned. On Saturday, January 9, the Prins Valdemar was resting on the north bank of the ship channel at the point where it opens to the municipal turning basin. On this day, a combination of receding tides and the location of the ship on the bank placed her in a vulnerable position. On Sunday, January 10, a strong north wind was blowing, and the force began to tilt the Prins Valdemar to her starboard side. The winds were strong, and it was clear that the ship would capsize. The crew and workman had only four minutes to evacuate the ship. All eighty men escaped as the boat completely turned onto its starboard side. Fortunately, most of the eighty men were on deck and could escape easily. Everyone on board escaped without any casualties. The position of the ship caused its mast to block the turning basin to the extent that other ships could not leave the port. Salvage crews began immediately to remove the ship out of its capsized position, but it proved very difficult. It took six weeks to finally prop the ship upright and get it into a position to be moved. It was relocated out of the turning basin into a temporary location until June of 1926. At that time, the Prins Valdemar was moved out of the way and relocated to a dock near SE First Street. The ship remained there for two years until the very persistent Captain Walters figured out a plan to make use of his investment. Many years later, the Prins Valdemar blocking the turning basin was considered one of several unfortunate events that contributed to the bust of the 1920s building boom. 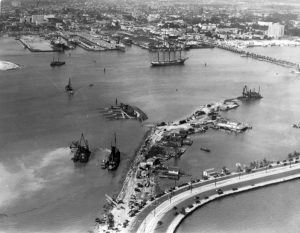 During the six week period to clear the ship from the basin, no shipments of building materials could get into the Miami harbor. Building activity was impacted by the blockage and many historians believe that this event demonstrated the vulnerabilities of the city. Construction was slowed and the momentum of the 1920s building boom began to wane. It was later learned that the Prins Valdemar had been shipwrecked once prior to 1926. When there was an article picked up in the San Francisco Chronicle about the ship in 1949, an old crew member reached out to Samnel Stout to share his story. Stout was the operator of the aquarium in 1949. Elias T. Ericson shared his story of the ill-fated voyage in 1911. He was a crew member on the Prins Valdemar when they were transporting goods to Mexico. The ship ran into a bad storm in the Gulf of Mexico and was blown into a sandbar where the vessel was stranded. 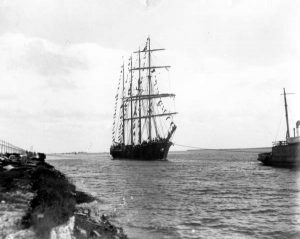 The ship and crew were rescued by an English ship ten days after the storm. The story of the ship’s capsize in the Miami harbor in 1926 reminded Ericson of his time as a crew member in 1911. Following the removal of the ship from the turning basin, the opportunity had passed to convert the Prins Valdemar into a floating hotel and cabaret. Captain Walters still wanted to make use of the vessel as a commercial entity but needed to raise money. It took two years, but Walters finally raised enough money to convert the ship into a floating aquarium. His first order of business was to move and moor the ship to a pier just north of Pier 5 at the foot of Sixth Street. Walters was given a lease by the city for $600 per year to rent the property north of Bayfront Park. It took through April of 1928 to convert the ship into Walter’s vision. The vessel needed to be reconfigured, aquariums were added, fish gathered and purchased to prepare the attraction for its opening. On May 1, 1928, the Prins Valdemar Aquarium officially opened. In 1937, the city decided to provide a steel bulkhead around the ship. The bulkhead was filled, shifting the Prins Valdemar from a floating aquarium to a land locked attraction. The bottom of the former ship was buried underground ensuring that it would be very difficult to ever move the vessel to a different location. During World War II, the Prins Valdemar was turned into a clubhouse for chief petty officers of the United States Navy. At the conclusion of the war, offers were made to turn the ship into a night club. However, it reverted back to a public aquarium until the late 1940s. 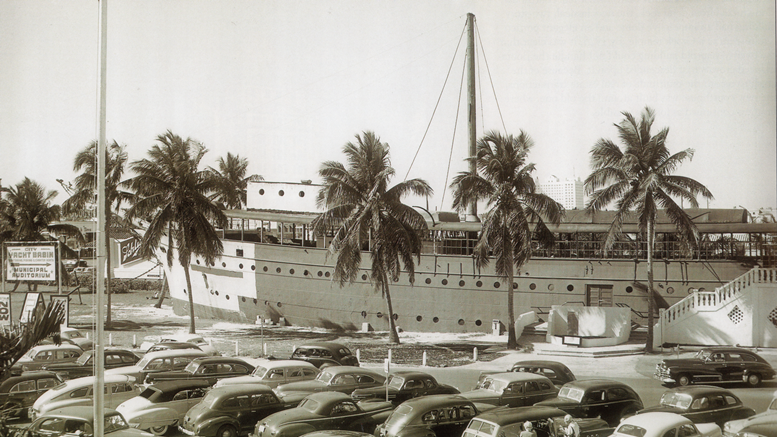 The retrofit of the ship to an aquarium became a Miami institution and provided many great memories for Miami residents during the mid-twentieth century. Captain Walters had two daughters, and the aquarium was a big part of their childhood. Family milestones were celebrated at the venue, and it was considered an important part of the family’s connection with Miami. By 1949, the aquarium operated in downtown Miami for twenty one years. It was that year that the Miami City Commission considered the old structure as outdated, an eye sore, and unsafe for a public attraction. A resolution passed on March 25 that the lease to the aquarium would not be renewed. Walters had ninety days to wind down operations for the aquarium. The fish in the aquarium were either released into Biscayne Bay or relocated to other aquariums. An article in the Miami Herald on February 22, 1950, described the release of many of the inhabitants of the aquarium. The operators of the Prins Valdemar would love to have sold or donated the 2,500 fish and mammals to other aquariums, but there just wasn’t enough time to sell them all. Many of them had to be released into the bay or ocean. There were a number of suggestions on what could be done with the Prins Valdemar after it stopped serving as an aquarium and restaurant. A Miami Herald editorial article suggested it be converted into a “nautical museum for the preservation of sailing ship antiquities”. However, the city had other plans. 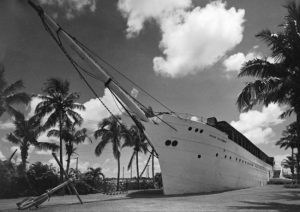 On January 5, 1950, it was announced that the ship would serve as a meeting place for the Miami News Youth Roundup organization. In addition, other local civic organizations and conventions would lease the Prins Valdemar for different events. The former aquarium continued to be used for meetings until May of 1952. City Manager JW Watson Jr. submitted a report to the city commission indicating that the Prins Valdemar was structurally unsound and lacked proper sanitary facilities for large crowds. The use of the facility was restricted until the city determined what to do with the structure. By July of 1952, the city fired the skipper, or facility manager, of the Prins Valdemar and began to solicit bids to raze the former landmark. The city commission accepted a bid by Atlas Iron and Metal Company. Atlas agreed to pay the city five hundred dollars to disassemble the ship and have the right to sell the salvage. The salvage company was only interested in the metal, so the city agreed to let them leave the wood and other materials onsite. Eventually, the city used the remaining materials as fill to be buried in place to fill in the rest of the old pier. 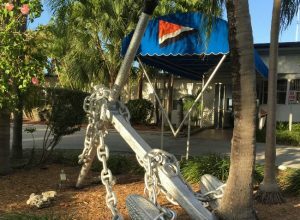 At the time of dismantling and salvage, the Miami Yacht Club purchased the anchor of the Prins Valdemar. The anchor was moved to their club on Watson Island. It is still proudly displayed at the front entrance, along the circular drive, of the club. It may be the only artifact that can still be traced back to the former ship. During the construction of the Dodge Island Causeway in 1964, construction workers unearthed the grave of the Prins Valdemar. A bulldozer came across wood and other remnants of the old ship that were buried under the construction zone. Like so many of Miami’s old landmarks, the ending is rarely graceful. The Prins Valdemar should be remembered as a vessel that lived many lives. Despite an ungraceful beginning in Miami, the ship served the community proudly for a good part of the last century. Miami Herald: “Ship Channel Blocked When Craft Capsizes”, January 11, 1926. 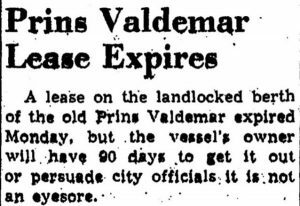 Miami Herald: “Prins Valdemar Towed To Yacht Anchorage”, June 18, 1926. Miami Herald: “Proud Old Sailing Ship Could Still Do Service”, May 20, 1949. Miami Herald: “Prins Valdemar Lease Expires”, June 8, 1949. Miami Herald: “Valdemar Leased For Youth Office”, December 30, 1949. Miami Herald: “Valdemar Prisoners Are Thrown Into Bay”, February 22, 1950. Miami Herald: “Prins Valdemar Held Unsafe”, February 21, 1952. Miami Herald: “Contract Awarded by City For Razing Prins Valdemar”, August 8, 1952. Miami Herald: “Grave Uncovered”, December 3, 1964. Biscayne Times: “End of the Prins Valdemar”, September 2014, by Dr. Paul George. Cover: Prins Valdemar Aquarium in 1940. Courtesy of HistoryMiami. Figure 1: Prins Valdemar in 1925. Courtesy of Bayfront Park Web Site. Figure 2: Prins Valdemar in 1926. Courtesy of Bayfront Park Web Site. Figure 3: Prins Valdemar capsized in 1926. Courtesy of HistoryMiami. Figure 4: Prins Valdemar Aquarium in 1940. Courtesy of HistoryMiami. Figure 5: Article in Miami Herald on June 8, 1949. Courtesy of Miami Herald. Figure 6: Prins Valdemar anchor at Miami Yacht Club. Courtesy of Miami Yacht Club. 3 Comments on "Prins Valdemar – A Miami Landmark"
Hi Casey. Nice article. A question: What about the ship’s wheel in the History and Ourselves gallery at HistoryMiami? It’s identified as being from the ship. It could be. I couldn’t find any articles referencing parts of the ship being donated to the museum. Is the ship’s wheel on the second floor? I need to come to the museum and check it out. Casey — did you find out about the Prins Valdemar’s wheel being at HistoryMiami or not? I just came across your Jan. 2017 article on the ship / aquarium. Capt. Walters’ remaining daughter, Alice L. Walters Wallace, passed away at age 90 in Jan. 2013. She had donated some other artifacts from the ship to the Miami History Museum (near Biscayne Park) back in 2006. Of course of interest is that where the AmericanAirlines Arena stands today is where the ship / aquarium once stood.